The fourth and final season of Star Wars Rebels is now on the air and it promises to answer a lot of questions. Some of those questions could even link to the two live-action movies set in the same timeline as the show: Rogue One and Solo. And though Rogue One has already woven its way in and out with Rebels, and will continue to do so, executive producer Dave Filoni told me that we should not expect Solo to do the same. That small galaxy makes sense, though, when it’s a character like Princess Leia. Besides Ezra, the main focus of Rebels is the creation of the Rebel Alliance, and Leia is a major part of that. Obi-Wan Kenobi is one of the few remaining Jedi, so as Ezra trains in that discipline, it makes sense for him to appear. “You just have to make sure you’re doing it for the right reasons and that you really want these characters to cross over,” Filoni said. But to work in some connection to a smuggler who we damn well know doesn’t want to get caught up in the Rebellion just yet would probably be a little much. 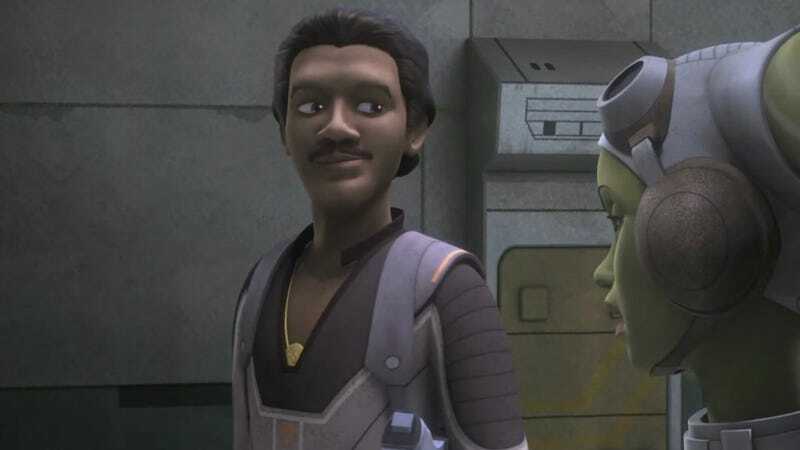 However, while Filoni denied any Solo connections, he does hypothetically think one Rebels character could fit in with his story. It’s true—figuring out which ship or pilot in the best in the galaxy does not make much sense when you’re fighting for the survival of the galaxy. And that’s what the rest of Star Wars Rebels season four is likely to be about. We’ll have much more from my interview with Dave Filoni soon. Star Wars Rebels continues Mondays on Disney XD.